As intricately embroidered blouses, vibrant floral kimonos, and brightly-colored tasseled earrings decorate department store racks this season, an Eastern flair is undeniably recognizable. Summer trends saw runways and boutiques chock-full of delicate stitching and embroidery techniques, pom-pom embellishments, and bejeweled bangles — all of which are carrying over into fall. But these trends aren’t exclusive to the West. 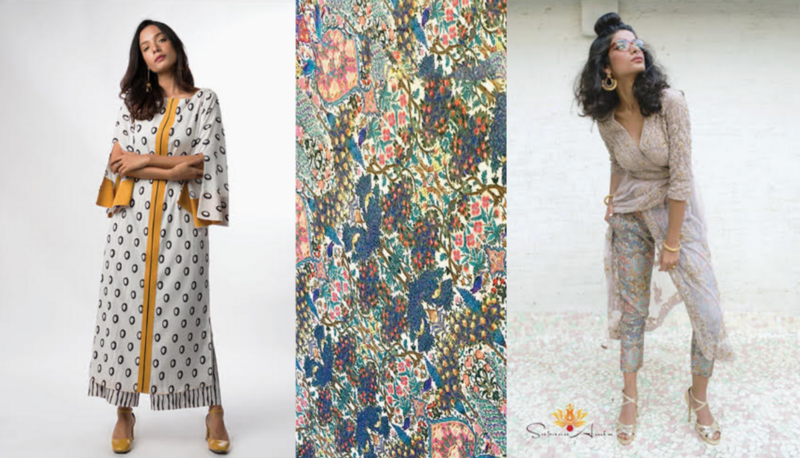 Age-old designs, cuts, and prints of the Southeast Asian countries—including Pakistan, India, and Bangladesh—have recently crossed over to the U.S., taking over well-loved summer and fall trends. A staple of Southeast Asian wardrobes that exploded on the fashion scene this summer and hasn’t faded yet is the “kurti,” or tunic. 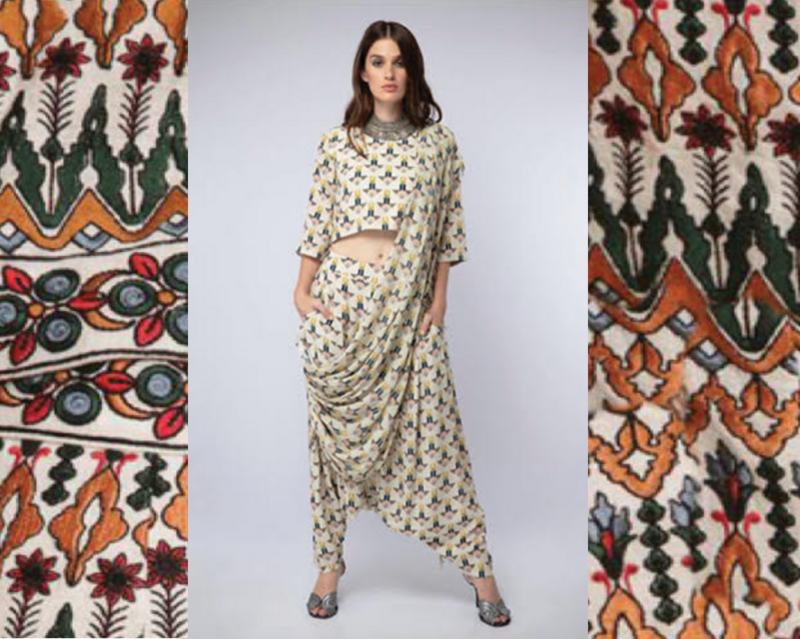 These knee-length, loose, flowing lawn tops are everyday wear for the women of Pakistan, India, and other countries in the region. Typically featuring intricate embroidery on the chest and sleeves, “kurtis” dominate Southeast Asian women’s clothing. PHOTOS: (left) Sandwa Long, Murkash Collection, available at lulusar.com. (right) Jen Dress, Sapana Amin, available at studioeast6.com. Wrapping and draping techniques characterize most Southeast Asian suits. The traditional Indian “sari” (also spelled “saree”) consists of a little less than 10 yards of fabric, skillfully wrapped around the body to create a draped skirt-and-top style. Similarly, the Pakistani “salwar,” or pant, and “kameez,” top, two-piece suit combination is commonly worn along with a “dupatta,” or long fabric piece, draped along the chest. These draping and stitching techniques are recalled in Western fashion by skirts, dresses, and tops. Another Western favorite brought over from the East — paisley prints. Paisley find origins in Kashmir and Persia, over 2,000 years ago. Now, the print typically adorns silky, flowing blouses and will be a staple for fall accessories — especially scarves. The West has simultaneously adopted accessories as well — dangling hoops and pom-pom details are only the beginning of a list of Eastern-style accessories adorning American models. Particularly appearing on earrings, shoes and occasionally on the trims of tops and pants, pom-pom and tassel details have ornamented Eastern clothing for centuries. South Asia isn’t the only region Western fashion trend pull inspiration trends from, though. “The [American] streetwear craze is directly Japanese fashion,” said VCU student designer Shana Cave, who traces her roots back to China. On a recent trip she took to Tokyo, she noticed overwhelming similarities between American streetwear and everyday clothing in Japan. The outrageous proportions and cuts, as well as monochrome looks, have become staples of U.S. streetwear brands such as Supreme and Yeezy Supply. The West has similarly adopted the cultural aspects of other East Asian countries, such as Japanese kimonos, Lao stitching and weaving techniques, and Thai two-piece outfits. But the Eastern-influenced fashion dates back much further than recent years, according to VCU professor Jackie Mullins. Mullins, who teaches the history of contemporary fashion to aspiring student designers, said that while the blending of these cultures into mainstream fashion has become incredibly common, it can come very close to disrespect if executed poorly. Sustainable fashion advocate and photographer Aditi Mayer defines cultural appropriation as “the continuation of misrepresentation, misuse, and theft of the stories, styles, and material heritage of people who have been historically dominated and remain socially marginalized.” The absorption of minority cultures by a dominant culture — typically by means of colonialism, oppression, or other power imbalance — creates a disconnect between the traditional item and how it is re-represented. PHOTO: Arrow Print Top, Dhoti Pants, Payal Singhal, available at studioeast6.com. For Singh, the latest summer trends have confused her — especially those poorly executed to mimic South Asian and Latin American blouses with floral embroidery across the chest. One of Singh’s favorite East-West fusion brands, Victoria Road, navigates the blending of cultures well. Cave agreed that the implementation of a lot of these fashion ‘trends’ in the West is not always the most respectful. As a child, Cave said she felt the need to suppress the half of her identity that was Chinese; making the trends that have crossed over from Asia all the more ironic. The best way to navigate the “cultural appropriation” discussion, according to Singh, is simply asking and learning about the meaning behind certain clothing elements. Fashion with a bit of Eastern flair is far from leaving the industry. So as the West continues to infuse Eastern elements into everyday clothing, it’s imperative to ask that question — why? Exploring other cultures, and understanding where certain cultural and religious elements come from, is necessary in order to be respectful while also admiring their beauty. Rising sea levels are a threat and its detrimental effects can be seen both abroad in our own backyard. Two short documentaries screened in Richmond over the weekend captured this very issue. EPA director Scott Pruitt recently said that the rapidly occurring climate warming “may not be a bad thing” should probably have watched Adaptation Bangladesh: Sea Level Rise, before commenting on the subject. 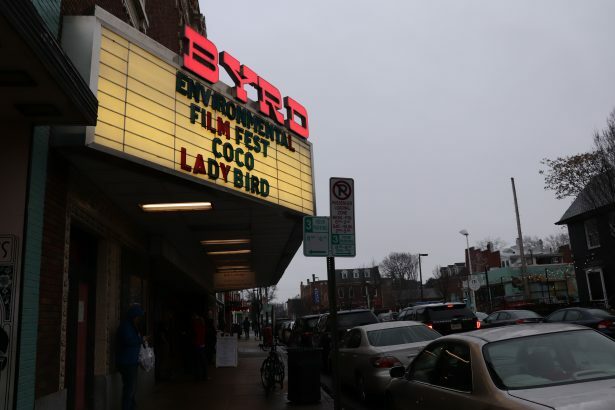 The film, which premiered this weekend at the annual RVA Environmental Film Film Festival, gives a glimpse into how people are adjusting and experimenting with new methods to deal with environmental change. Specifically, how the people of Bangladesh are coping with the tremendous impact of rising sea levels. 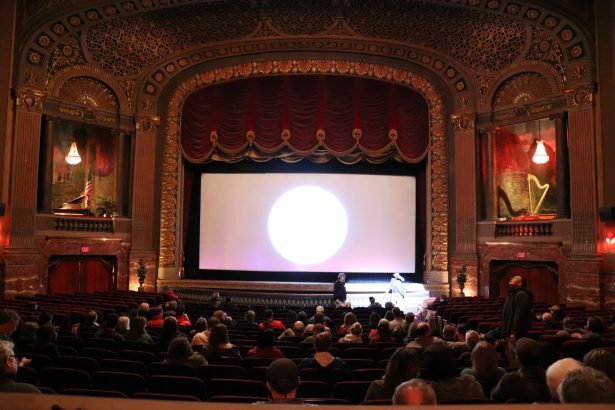 The 8th Annual Environmental Film Festival, which featured local and national films at several venues around town this past week and weekend, aimed to educate and raise awareness on a variety of environmental issues from the Dakota pipeline protests, to rapidly disappearing coral reefs, to the Flint water crisis. Directed by Anne Phillips, Adaptation Bangladesh: Sea Level Rise highlights how Bengalis farmers are improvising by building organic floating gardens and other buoyant infrastructure. Most notable were the floating gardens that are at least these 20 feet long structures that is a mishmash of several things including manure that the Bengalis use to grow their crops. Life must be difficult for those in the in the flooding zones of Bangladesh, but they have found a way to adapt and survive. Adaptation Bangladesh: Sea Level Rise is just one part of a three-part series by Phillips. Closer to home, rising sea levels are also impacting Hampton Roads with flooding occurring at an abnormal rate as shown in the screening of Tidewater. The documentary, directed by Roger Sorkin, takes a look at the home of the world’s largest naval base, and the looming impact the rising sea levels and sinking land could have on national security. It delved into how difficult the lives of those in the Chesapeake, Norfolk, Newport News, and Virginia Beach can be on days of extreme flooding. B-roll and drone footage displayed of people kayaking through the streets and cars with water reaching as high as the cars’ windshields. Hampton Roads needs $1 billion in critical infrastructure repairs with 900 miles of the area’s roads threatened by the flooding.Tackling the issue will mean stakeholders, citizens, the U.S. Navy and local businesses coming together. This film showcases local leaders pioneering whole-of-government problem-solving model. Though economics shouldn’t be the sole purpose for us to take action and reduce our carbon footprint, it is a great selling point to those who are lackadaisical about the issue. A lot of interviews were conducted throughout the film, but one that really had an emotional pull was a middle-aged woman who had to commute to take care of her elderly mother. On some days the roads were too flooded for her to visit so she went out to buy her a life vest in case of an emergency, as the elderly woman is years past her being mobile. Even though the science isn’t as clear-cut as most environmentalists stress, it is pretty obvious that two things are occurring: human activities have a direct result in increasing the average global temperature, and higher temperatures will result in sea rise, especially in most coastal areas. I am biased when it comes to this issue, but both of these films have shown what climate change has done and will do and the film festival did a great job of showcasing pressing issues facing us around the world.